Liberal billionaire George Soros has eclipsed a personal record amount on lobbying throughout the first three quarters of the year and has already spent $4 million more than he did throughout the entirety of last year—his previous yearly record—disclosure forms show. The Open Society Policy Center, the financier's Washington, D.C.-based 501(c)(4) nonprofit that focuses on domestic and international advocacy efforts, has ramped up its lobbying efforts since President Trump took office. The policy center spent a combined $19.1 million lobbying between 2002 to 2012, an average of just $1.9 million per year. Soros's firm slowly began increasing its lobbying the next few years, hitting $12.4 million in 2014. The amounts dipped down the following two years to $8,160,000 (2015) and $5,460,000 (2016). However, the firm's expenditures shot up to $16.2 million during Trump's first year in office, a personal record amount for any given year. "We make different grants each year depending on what is happening in Congress and there was a lot going on in 2017: Protecting immigrants and refugees, preserving fairness in the tax code, advocating for criminal justice reform, pressing for disaster relief for Puerto Rico, and promoting a progressive U.S. foreign policy," Jonathan Kaplan, a spokesman for the Open Society Policy Center, previously told the Washington Free Beacon on last year's record amount. Now, the financier has already surpassed that total with three months left to go in the year. Soros spent $2,520,000 during the first quarter of this year, $10,370,000 during the second quarter, and $7,700,000 during the third quarter, disclosure forms show. Soros has now put $20,590,000 toward his lobbying efforts for the year, an amount that is already $4,390,000 more than last year’s record. The Open Society Policy Center's most recent lobbying expenditures, which cover July 1 to Sep. 30, show a prominent focus on international issues. 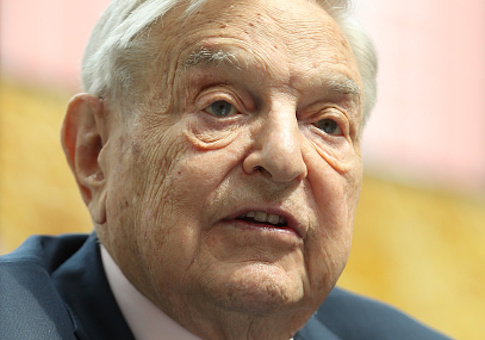 Soros focused on issues related to North Korea, amendments to education acts in Hungary, government transition assistance in Armenia, violence in Ukraine, and the nomination of an assistant secretary at the Bureau of Democracy, Human Rights, and Labor at the State Department. Soros also focused heavily on issues involving foreign agents such as the Foreign Agents Amendments Act of 2018, Foreign Agents Modernization Act and Enforcement Act, and the Foreign Agent Lobbying Transparency Enforcement Act, among other issues. The group lobbied the Senate, House of Representatives, and the State Department the last three months, its forms show. The Open Society Policy Center is an entirely separate entity than that of the Open Society Foundations, where Soros cuts grants to numerous progressive causes and organizations. The policy center's most recently available tax forms from 2015 show the center pulled in $17 million in contributions that year, more than twice what it had the year prior. The center did not respond to a request for comment on its new record amount on lobbying by press time.